Hi Itay, please introduce yourself to the Isratrance readers. Who are you, where are you coming from and where are you going? Itay: Hi, I’m Itay Berger, 31 years old and from Jerusalem at the moment. 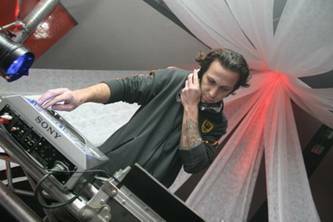 I have 12 years experience as a Dj and for 10 years I am also creating music alone and with friend, including live instruments. You are responsible for a number of projects at the moment, Kukan Dub Lagan, Itaitaiko and Raijin Gaijin. Can you tell us a little bit about them? 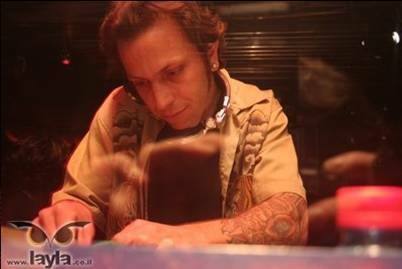 Itay: Well, Kukan Dub Lagan is my favorite at the moment because I have been Dj’ing Dub and Reggae for years I’ve had the urge to create my own music, Psychedelic Electronic Dub. Something easy to listen, simple and also pleasant to ears. Itaitaiko came after years of going to Trance parties. I’ve been going to Trance parties since age of 16 so creating Trance for me was unavoidable. Raijin Gaijin is my new project and also a Dj alias. With Raijin I aim for the more mainstream direction but still try to retain a unique character to my music. After years in the scene I decided to gather all my projects under one record label, Mikelabella Records, under which I shall be unbound to any musical genres and will be able to release my own music and other artists’ music as well. After listening to your albums it is obvious that you were inspired greatly by Dub and Reggae. What can you tell us about the music that you grew on? 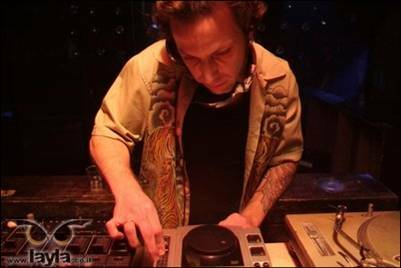 Itay: I grew up on quite plenty genres of music because my uncle was a club Dj in Haifa many years ago (He’s 70 years old now) and he has a big vinyl collection (many thousands) so I grew on mostly music from 60’s and 70’s, mostly 70’s psychedelic music. And also lots of early Reggae, Ska, Dub, Ethnic music and Electronic music, stuff like Jean Michelle Jarre. I was never locked on one genre and was always pro free musical expression. Never to focus on only one genre but to expand as much as possible. Recently you have opened your own label. Can you tell us more about it? Itay: Mikelabella Records is a label that I’ve opened with the agenda to release unique musical genres that will sound different than most of the music that is released nowadays. Not that I think that there is no good music today, there always is and it is a matter of a personal taste, but I feel that today people are afraid to go for something different and always try to go for a winning formula. I wanted to release my music and music that I liked and that I think deserves to be released, without economical considerations which are the main thing these days. This label is still an experiment of a sort, but I believe that with time it will get the public's recognition. We intend to release Dub, Tech-House, Freestyle and any genre that will sound different to the musical state that prevails these days. In our plans there’s a Raijin Gaijin album called “It’s time to spin” and a joint album with Master Margherita from Peak Records in the making and also a few more projects that we’ll be able to announce only when we’ll be 100% sure about them. Correct me if I’m wrong here but opening a label nowadays is quite a financial move. How can you say that you don’t have any economical motives? Don’t you want at least to break even? The artistic element is of course very important here but at some point I think that you’ll decide to release something to please the crow, wouldn’t you? Itay: Opening a label today is not the same as opening a label back in a day. As a matter of fact it is much easier to make it work nowadays with the internet and all the communicational technology that we have today. True. But investment is still an investment. Itay: Yes, investment is still an investment, but it’s better to invest in something you love and believe than something you believe can bring you money. There is a difference here. I have a family, and of course I don’t want to release CDs for fun but for some financial income that I believe in and not to get rich from. I don’t really believe it can happen. Most chances are that an income shall come from gigs abroad than from CD sales. In Trance scene when an artist sells 1000 copies they say thank you. No comparison to Madonna here, there are scenes where selling 10000 is not worthwhile. The money is in the live and in Dj gigs. That said, I think that the recognition of the music you create is in the CDs you release. There’s always some medium that makes you famous. In 10 years from now there will be somebody who will listen to your CD. He won’t remember your live or a Dj gig but he will put your CD on and will listen. One of the things that I like the most in Dub is all kinds of albums with Dub versions of Rock albums, like for examples Easy Star All-Stars’ Dub Side of the Moon album and Radio Dread. In the Psy-Chill scene we have of course Ott’s rendition of Hallucinogen’s classics named Hallucinogen in Dub. Have you ever pondered about creating something in that direction? Itay: There are many Dub versions to many musical versions for well known songs and in Psy Trance scene as well (like Shulman’s remix for Sub6 for example). I’m personally always open for remixes and genres and I don’t have a problem to do something of that sorts. If somebody will ever approach and ask to make a Dub remixes album I will be truly honored. I believe that musical creation becomes strong and loved because of the crowd that appreciates it, and the appreciation is the driving force behind the artists’ will to create music. How do you see the future of the music industry, in the aspect of musical content’s distribution? Do you see the future in the digital distribution or do you think that the good ol’ CD still stands a chance? Itay: In spite of what many people think, the digital distribution still has very small percentage compared to CDs market today. Most of the people in the world don’t even try to buy music through the Internet. I do believe that the digital distribution is easy and convenient way to distribute. If you see it global than perhaps you’re right, but there are markets where the percentage of digital distribution is quite high and in constant rise. Itay: True, but there are many that love to “touch” the music they purchase and Trance industry is a very good example because the sales declined recently. Globally it’s not as big as some people presume. From my short acquaintance with you I know that you traveled a lot in the world. Where do you feel is the best place for you? Itay: The truth is that it’s Japan, many years ago there I felt best, and in Switzerland as well. But with all my journeys in the world I can’t discount Israel and its’ crowd. The feedback in Israel is a feedback that many artists in the world would like to feel. Recently your first daughter was born. So first, congratulations and second how does she reacts to your music and do you feel some sort of inspiration from her presence? 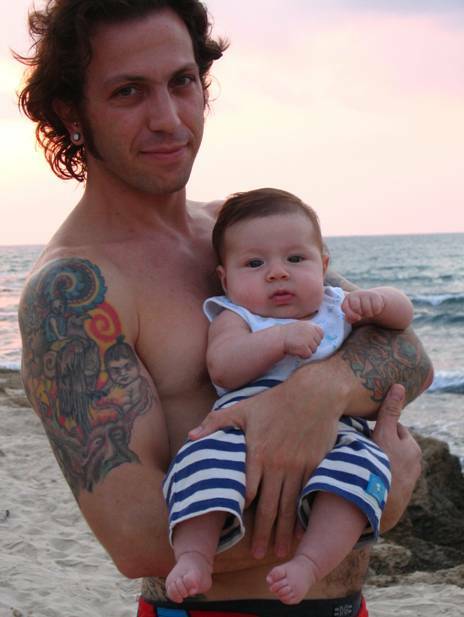 Itay: Sofia for me is an immense source of inspiration in my life; I even work on some music for her at the moment. Some sort of lullaby for her. One of the first things that people notice on you is your tattoos and you got them plenty. I think the only person in the scene that has more tattoos is Dj Jorg. Can you tell me a little about what draws you in tattooing? 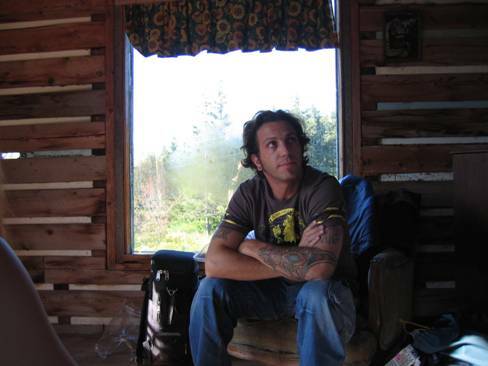 Itay: Well, what draws me with tattoos is the art of it. Some years ago I was working in a tattoo parlor as a piercer and from childhood I was in love with the idea that a man can put a permanent painting on him and have it all his life. There is a dispute regarding this art, maybe today less than before, but once on every bad guy in a movie there was a tattoo, like in Cape of Fear with Robert De Niro. Today it’s very common and commercial and every second kid in Israel has one. What advices can you give to a young artist regarding their approach to parties’ organizers and labels? The truth is that many artists feel very disappointed in the recent years, so they just went and opened their own labels but in the other side, there are many artists that disappointed many labels and organizers as well. A newcomer today should be as professional as possible, it doesn’t warrant he won’t get ever hurt but if it’s possible he should go through all the contracts with a lawyer. A new artist should also check with other artists that released on the same label regarding their reliability and they shouldn’t always jump on the deal without checking everything possible. And also of course behave respectfully to everybody and expect the same. The market is rough but there are always good people and there’s always somebody to ask.